There is no better time to gather around with family and friends than during the winter holidays. Brighten your home with glittering ornaments and relax with some sparkling drinks and yummy hors d'oeuvres. This past weekend, I was watching an HGTV special about decorating the White House. The photo above is from a mantle piece in the East Room. HGTV, has a great gallery of photos to show the incredible job volunteers did for our Nation's Home. One of the things that struck me is how the decorations are a combination of vintage and hand made. 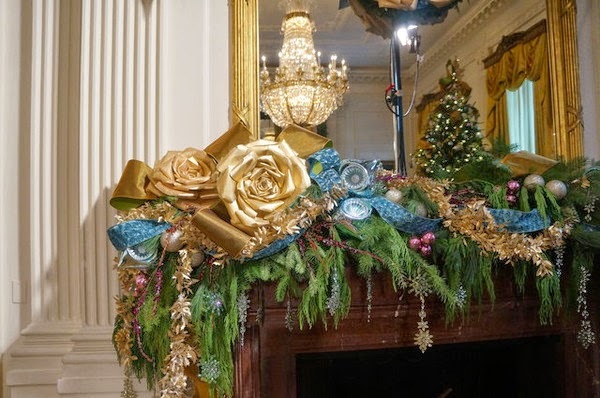 The roses on this mantel are hand made from paper to decorate the White House. In other places. they uses clusters of balls that they hot glue to create together to hang on hallway swags. Why not take a queue and create some handmade ornaments - even a paper or felt snowflake on a gift adds that special warm touch. It is also an incredible time to bring nature into your home with pine swag, boxwood or a live wreath at your door. If you don't get a live tree, bring the scent of Christmas into your home with live greens or fresh evergreen candles. Nothing smells more like winter, or makes your home feel cosier.